Shin splints are arguably the most common running problem/injury runners of all levels face. Whether you’re just starting our you’re an elite runner training for the Olympics, chances are you’ve probably had shin splints at one point or another. Over the past week I have received three separate e-mails about shin splints and myself took 5 days off of running because of the horrible splits! So what causes shin splints and, more importantly, how can we fix them? First, we need to understand what shin splints are. When I was in middle school and high school shin splints use to come on like clockwork every spring during the first week of track practice. Why? Because I was doing too much too quickly and my body needed to get used to it (but have been something about not training during the winter…darn coaches were right). 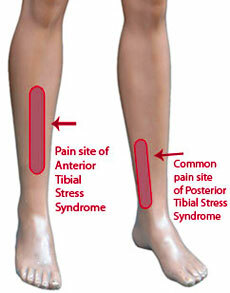 Shin splints are a catch-all term used for pain located in our lower legs. When the pain is located on the front outside part of the leg they are called anterior shin splints and when they are on the inside of the leg they are medial shin splints.Essentially, shin splints are a shorter work for medial tibial stress syndrome. Key word: stress. You are stressing your body! Too much, too soon! If you have shin splits, there is some type (even if small) injury to your bone and/or muscle tissue. Forcing yourself to run through that can make that work. Your shins are just like any bone. If a baseball pitcher has small but painful tears in his shoulder, should he continue to pitch? No! And neither should you! ICE: Place ice bags on your shins several times a day while you elevate your legs. I did this one leg at a time while at work or both legs at the same time while on the couch at home. The ice is instant relief and helps with the inflammation. *Extra Tip: freeze water in a paper cup, peel back the paper and roll the exposed ice cup along your shins. COMPRESSION: Rock a pair of compression socks (CEP or any other brand) because feel great and help with recovery. There’s no real “science” here to prove that they help your shin splints, but I certainly felt a difference. They are pictures above with my sweet candy candy PJ’s…and yes…my compression socks are pink (who is surprised?)! REST (sort of): Take a couple of days off of running. Recently I took 5 days off of running because of shin splints and spend my time in the pool or on the bike instead. It does not mean you have to quite yoru cardio routine, it just means you need to decrease the impact. STRETCH: There are a few ways to stretch your shins out (including stretching out your calf and Achilles tendon). My favorite is to kneel on a carpeted floor with your legs and feet together – feet/toes pointed back. Slowly sit back onto your calves/heels and push your ankles into the floor until you feel the stretch along the front of your shins. KT Tape: I’ve yet to try out KT tape…but I am intrigued! While researching, I came across a few helpful tips from our friends over at KT Tape that you may want to check out. The photos are helpful as KT Tape can be tricky business! Again – I am not doctor. If you are experiencing excruciating pain (more so than your average nagging shin splint) please consult a health care professional. I suffered with stress fractures in my ankles and before started running with shinsplints its not the nicest ailment to have and have to agree that the only treatment is rest and to back off until you feel able to continue. Also KT tape does work I’ve tried it and wow! What a difference in a week or two after using it. I really want to try KT Tape! My shin spints are gone for now – but if they come back I am going to reach for the KT Tape. I have used it for shoulder injuries but never for shin splints of anything on my legs. How did it help you/what is the science behind it? Shin splints are typically caused due to muscular imbalances and poor movement patterns. Improvements in hip mobility, gluteal and core strength, as well as posterior leg flexibility will all help reduce, if not eliminate, shin splints from happening. People who chronically suffer from shin splints typically do not warm-up dynamically, foam roll, or do resistance training properly. Often times, they’ll simply warm-up by running and may do little in the way of lifting weights. Great tips! Do you have any training stretches or workouts that help in particular? KT Tape is great! It helps with my runner’s knee – much better than the knee brace I was using before. I’d highly recommend it. Glad they helped you out! Do you have a brand that you liked? I noticed a few brands being sold at the store yesterday. I bought the original KT Tape, but I’ve heard that KT Pro Tape is better. I’ll probably get that next time. One is cotton & the other one is synthetic. I personally like the pre-cut strips. Make sure to follow the directions on the pamphlet or online when using it, so that it adheres to your skin in the best way possible. For example, make sure your leg or is clean & free of lotion. That way it sticks to your skin better. Hope this helps! Thank you – I’ll be on the lookout for it! The science behind it is fascinating! curious about your situation; many of us have developed some nice procedures andd we are looking to exchange methods with others, please shoot me an e-mail if interested.